Sea, Sand & Sky: Mr Lobster? Miss Lobster? Many people do not know the difference between a male and female lobster. 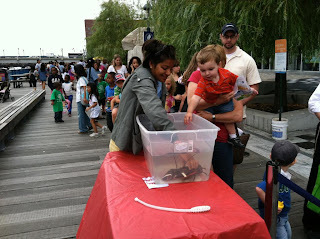 At the children's museum we borrowed a lobster from a sea food place called "Hook". We used the lobster to show the kids different things about its anatomy. I explained to them the difference between a female and a male. I told them that if the Swimmeret part was soft and hairy, it was a female and that if the Gonophore was hard, it was a male. In the afternoon at Community Boating, I went fishing with the kids. We used sugar, water, and flour as bait to catch sunfish. There was one child that caught over five fish. We realized that the technique we used was really working. It was weird at first to know that fish would eat flour and sugar, but I learned that fish mainly eat anything. A LOBSTAH?! IN THE HAHBAH?! Is That a Lobster in Our Crab Trap!? Seeding Clams in the Boston Harbor!!! Trash is Treasure on Shell Beach! River Monsters In The Charles?